The Qur’anic text has been widely used in Islamic architecture, mostly with a decorative aim. The beauty of Arabic calligraphy is well-known and as the human and figurative representation in building decoration was discouraged, if not entirely forbidden, just from the beginning of the Islamic time, the Word of God was used for decorative purposes. It is maybe for this reason that scholars seem to have disregarded the Qur’anic content of monumental inscriptions in their surveys. In fact, scholars and researchers seem to have been (and to be) more interested in epigraphy as a source of historical information. In the indexes compiled starting from the end of the 18th century (the Materiaux pour un Corpus Iscrptionum Arabicarum and the Repertoire Chronologique d’Epigraphie Arabe) the surveyors are much interested in recording the (extremely useful) historical texts, but do not delve too much in the Qur’anic parts of the inscriptions. Qur’anic quotations are seldom mentioned and when they are, only the sura and verse numbers are to be found. The lack of a transcription implies two main problems: first the reader does not now if the verse is totally or only partially quoted, and secondly the numbering system used is not clear, whether the Fluegel’s or the Cairo edition. This lack of interest in the Qur’anic inscriptions is also because the Sacred Text inscribed was considered to be only a public expression of faith. Some scholars in the last few years have nonetheless underlined how the Qur’anic quotations were chosen carefully in some instance and are also meaningful to understand the building context of the monuments. Estelle Whelan, Erika Dodd, Sheila Blair and Jonathan Bloom, among others, have underlined this point in various articles and studies. Scholars have underlined how the use of the Qur’an can be “creative”, which means that patrons used to choose carefully the quotations that would fit at best the context. 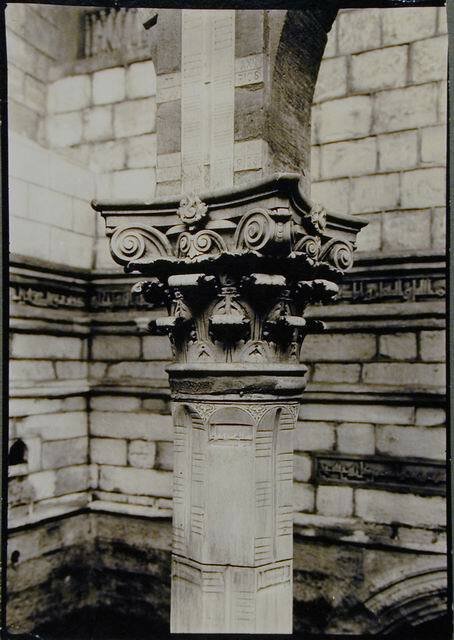 Nilometer © Creswell Archive, Ashmolean Museum, neg. EA.CA.2484. This is strikingly true for the Nilometer, built in 861 c.e. by the ‘Abbasid al-Mutawakkil on the Rawda Island. The building serves an utilitarian purposes: it is a sort of device to measure the level of the river and foresee annual floods. It is quite interesting that the Qur’anic quotations inscribed on its walls are related to the water. The Qur’anic passages belong to different suras and have been juxtaposed because of their content. More interestingly, a contemporary source clearly states how the passages were chosen according to the context in which they were to be inscribed. The Nilometer seems to be the only instance in which the historical sources clearly state the deliberate choice of the Qur’anic text. Even if in other instances the sources do not provide explanations for the choice of the text to be inscribed, it is plausible that in many instances a deliberate choice has been made. 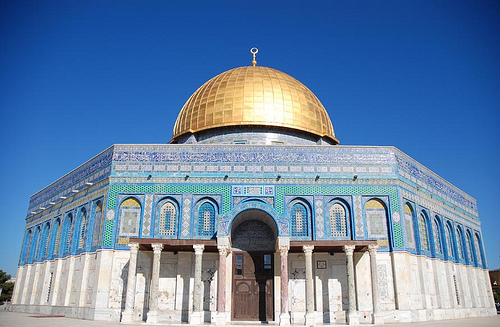 In the Dome of the Rock of Jerusalem the Qur’anic quotations juxtaposed are all concerning the tawhid and both Estelle Wehlan and Erika Dodd have underlined how this choice was related to the context. On the one hand the tawhid can be seen as being there as a reaction against the Trinitarian dogma of Christianity, the Christians being a strong religious group in 7th-century Palestine. On the other hand a passage inscribed on the Dome was also used on the coins struck by the Ummayyad caliph. In this sense the inscriptions on the Dome of the Rock can be read as an iconographic programme but on a wider point of you they are closely related to the patronage and to the context. This area of research is intermingled to a variety of fields. Qur’anic quotations help understanding the context but in a way they are also understandable through context. Reading an inscription in context implies a deep understanding of the period of production not only in term of political and economic history but also on a religious, social and cultural point of view. The Qur’an exegesis of the period of production clearly can help understanding in what sense and to what extent a quotation was meaningful in the period. Furthermore, a comparison between the occurrences of the same quotation would help tracing the evolution in the meaning of the text. When considering an inscription, it is not only the content to be important, but also a number of collateral consideration: the position in the building, the style, and the material used. These three elements help solving the question of readability and legibility of the Qur’anic quotation, in order to define the purpose of the inscription itself. E. Whelan, “Forgotten Witness: Evidence of the Early Codification of the Qur’an”, in Journal of the American Oriental Society, 118/1 (1998), pp. 1-14.